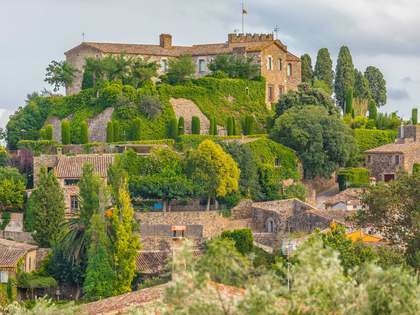 This superb Girona equestrian property for sale is located in stunning countryside surroundings in the hills of the Alta Garrotxa with breathtaking views across the region's emblematic volcanic hills. The property currently operates as country retreat with equestrian facilities, offering riding excursions and equestrian trails through the property's 43 hectares of private land. 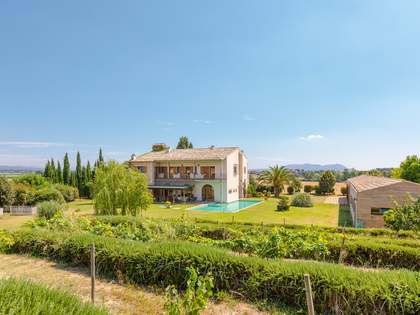 The Girona country estate to buy offers complete privacy and is conveniently located just 2km from the nearest village and only 15km from the historic town of Besalú. Access is via asphalt road and the property benefits from mains electricity, mains water and private well water. The property was fully restored by its current owners in 2002. The restoration work has ensured that the house still maintains a rustic charm yet offers all the comforts of modern living. Formerly a wine growing estate, there are flat open fields around the house for the horses (including a 40m x 20m exercise ring) whilst the rest of the land comprises oak woodland. Planta baixa: vestíbul, una sala d'estar amb terra de pedra i llar de foc, gran cuina, despatx, 2 dormitoris amb bany privat: una d'elles amb vestidor, una sala-menjador gran amb terra de tova i magatzem. Primer pis: distribuïdor central, rentador, cinc dormitoris (tots ells amb cambra de bany), gran sala d'estar i magnifica terrassa coberta. - Mains and private water supply. Pumps and pressure groups. The property enjoys complete tranquility and privacy yet is only 2km from the nearest village and only 15km from Besalú. The city of Girona and its international airport is only 45km away, Olot is 15km away and the city of Barcelona just 145km away. 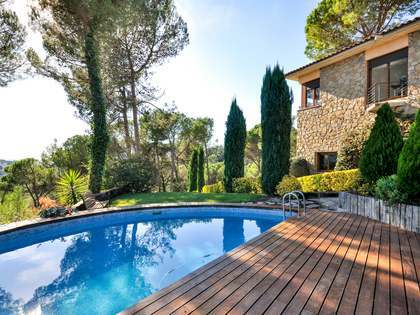 This is a superb Girona country property to buy. View more Girona real estate for sale.